Jerry Rhein was born on March 20, 1933, in Vineland, New Jersey. He attended Miami University in Oxford, Ohio, for two years before enlisting in the Aviation Cadet Program of the U.S. Air Force on December 3, 1953. He was commissioned a 2d Lt and awarded his pilot wings at Waco, Texas, on March 14, 1955, and after completing Interceptor training, he served as a fighter pilot in West Germany from July 1955 to June 1957. Lt Rhein next completed F-84 Thunderjet and F-100 Super Sabre Combat Crew Training, and Instructor Pilot School, before serving as an Instrument Instructor Pilot with the 831st Operations Squadron at George AFB, California, from October 1958 to February 1962. His next assignment was as a Forward Air Controller (FAC) with the 2nd Air Division at Tan Son Nhut AB, South Vietnam, from February 1962 to January 1963, followed by service as a T-28 Trojan and U-10 Courier pilot with the 319th Troop Carrier Squadron, Commando, at Hurlburt Field, Florida, from March 1963 to February 1964. Capt Rhein served as an A-1 Skyraider pilot with the 603rd Air Commando Squadron at Hurlburt Field from February 1964 to November 1965, and then served as an A-1 instructor pilot with the 4409th Combat Crew Training Squadron at Hurlburt from December 1965 to September 1966, when he deployed to Southeast Asia for a 2nd tour of duty. Maj Rhein next served as an A-1 pilot with the 1131st U.S. Air Force Special Activity Squadron at Tan Son Nhut AB, South Vietnam, from September 1966 to September 1967, followed by service as Chief of the Fighter Branch with Headquarters U.S. Air Force Special Air Warfare Center at Eglin AFB, Florida, from October 1967 to August 1968. He then served as an A-1 instructor pilot with the 4407th Combat Crew Training Squadron at Hurlburt from September 1968 to August 1971, during which time he deployed to Southeast Asia from January to June 1970, and in November 1970, where he participated in the Son Tay Raid to rescue American Prisoners of War held in North Vietnam. Maj Rhein served with Stan/Eval as an A-1 flight examiner with the 1st Special Operations Wing at Hurlburt from August to January 1972, and he again deployed to Southeast Asia during this time, as a T-28 pilot from August to November 1971. He next served as an AT-28 instructor pilot with the 4407th CCTS at Hurlburt from January to October 1972, followed by service as Commander of the Air Operations Center for Project 404 with duty station remaining with the 4407th CCTS at Hurlburt from October 1972 to April 1973. His final assignment was as in Stan/Eval as a flight examiner with the 1st Special Operations Wing at Hurlburt Field from May 1973 until his retirement from the Air Force on December 31, 1973. After retiring from the Air Force, he flew as a civilian pilot for Bird Air, Britt Airways, and as a corporate pilot, and later volunteered with the Okaloosa County Sheriff's Department in Okaloosa County, Florida, from 1989 until his death. Jerry Rhein died on February 15, 2010. He was inducted into the Air Commando Hall of Fame in 1997. 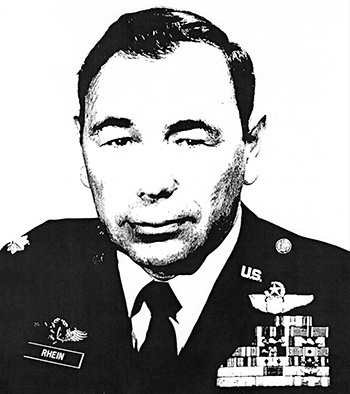 Major Edwin J. Rhein, Jr., distinguished himself by gallantry in connection with military operations against an armed enemy of the United States during the Prisoner of War search and rescue operation at Son Tay, North Vietnam, on 21 November 1970. On that date, as an aircraft commander of a flight of attack aircraft providing close air support for the rescue ground forces, Major Rhein, with complete disregard for his personal safety, and in the face of intense enemy ground fire, antiaircraft artillery, and surface-to-air missile fire, repeatedly led his flight against enemy ground forces attempting to engage the rescue party. As a result of his leadership under fire, enemy reinforcement efforts were totally unsuccessful and the rescue force was able to complete the mission without a casualty. By his gallantry and devotion to duty, Major Rhein has reflected great credit upon himself and the United States Air Force.